One of the biggest challenges that Europe will have to face in the coming years is the strains that changing demographics, and lifestyle are putting on the healthcare sector. Today 86% of deaths in the European Union are caused by chronic diseases. Chronic diseases are long term health conditions, mostly non-communicable (i.e. non-infectious) that are predominantly not curable but require lifelong management. Chronic diseases in the European Union affect all member states. In Europe chronic diseases affect more than 80% of people aged over 65 and they are responsible for nearly 80% of the health budgets. 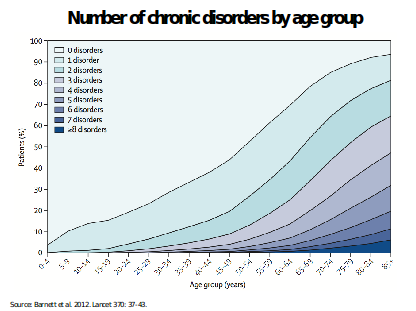 And thetrends are showing that more and more young people are affected by chronic diseases. The current situation has precipitated the need to redefine the European healthcare system to suit the needs and challenges of the 21st century. In the light of the changes that will be necessary for the coming decades the debates need to shift the paradigm. As Dr. Margaret Chan, Director General of the World Health Organisation states “All ministers are health ministers”. In order to address behaviour modification across the value chain, different approaches and thinking are needed. Changing patterns of disease, socio-demographic transitions, emerging technologies, emerging models of care, changing expectations of consumers and changes in the political and economic environment (globalisation, economic constraints) are all challenges facing our healthcare and that require new thinking and approaches. Take for instance prevention: according to the World Health Organisation, avoiding cigarettes, alcohol and junk food and making 30 minutes of physical exercise each day, could prevent up to the 80% of new heart disease, stroke, and type 2 diabetes cases. But how can we encourage healthy habits and prevent chronic diseases from arising? It is often noticed that only around the 3% of EU public health budget is spent in prevention, and that citizens often lack the information necessary to take healthy choices. But is this a responsibility of the public sector of the individual citizen? Seeing that today 10% of patients – the so-called high-cost patients- account for 65% of spending on healthcare budgets should good behavior and habits be incentivized? What is the role of employers or schools? These are the type of questions where it is still unclear what the right answer should be. For this reason, Atomium European Institute for Science, Media and Democracy launched a citizen engagement and media campaign on REIsearch in order to create a public debate between policymakers, scientists and citizens to create a real public discourse on the topic and better understand the evidence, the constraints and the opinions of citizens across Europe. Habermas defined a public sphere adequate to a democratic society as depending upon both quality of discourse and quantity of participation: this is what REIsearch wants to help create at a European level. For 5 weeks in March 2016, a set of very diverse issues related to chronic diseases: from big data to social innovation, from E-health to the connection between wealth and health, were introduced on the REIsearch platform and through social media channels. “Only with a renewed dialogue between researchers, citizens and policy-makers will Europe be able to meet its increasingly complex challenges. And cooperation across sectors and countries is indeed the best trigger for creative thinking, and the key incentive for innovative solutions to complex problems. REIsearch provides the right kind of genuine push towards stronger evidence-based policy making, more informed citizens, and better science – this is why I so eagerly look forward to the results of the first REIsearch initiative on Chronic Diseases“.